■At Akiba Kart Osaka, we provide tours carefully planned out by local Osakans! All the staff members are local Osakans! Akiba Kart Osaka is a one-of-a-kind tour that was created on the basis of wanting more people to love the city of Osaka. We would like to share the best parts of Osaka through this awesome touring experience! The tour route includes the popular sites that we would like for all the tourists to visit. On the day of the tour, you will have a friendly tour guide that will drive around with you while radiating Osakan vibes! 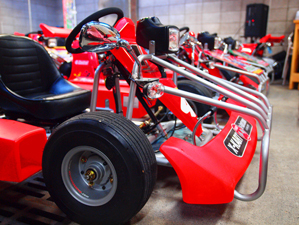 If you want an amazing experience while in Osaka, Akiba Kart Osaka is more than happy to be at your service! ■Check out our official Instagram page for the newest pictures from the tours! We will drive through wide streets towards Osaka Castle Park. Once we’re there, we can take pictures with the historical Osaka Castle in the background! We will be driving through busy streets— which means you will be getting a lot of attention! You can enjoy your time feeling like a famous celebrity! Please choose the day and time of your tour to make a reservation through our website. You can make a reservation up to two days before the day of your tour. 2. Check your belongings and outfit on the day of your tour! After making a reservation, all you have to do is come to our shop. HOWEVER, please make sure to check your belongings and what you are wearing. Shoes: Please do not wear high heels, snow boots, or anything that may affect the way you drive. Clothes: Please do not wear long skirts and drapes for safety reasons. Because we will be driving outdoors, it is always a good idea to dress according to the weather. 3. Check in at the store! After double-checking your belongings and your outfit, all you have to do is head to the store! Our store is located 7 minutes away by foot from Namba Station, and 9 minutes by foot from Nipponbashi Station. Please check this page for more information regarding navigation. Don’t hesitate to give us a call if you get lost! After checking in, the staff will explain how to operate the vehicles, and also inform you about important rules to follow. Please don’t hesitate to ask any questions if you are worried about anything! Safety First! Please make sure to pay attention to this short crash course to have safe fun! Once you have received the crash course, it is finally time to drive! A well-experienced staff member will lead you through the busy streets of Osaka. Please feel free to take any pictures! Let the staff members know if they can help you in any way! Don’t forget to stay energetic!! Have fun touring Osaka with your tour group! The most exciting tour in Osaka is waiting for you!! Make a reservation now to experience this fantastic tour in Osaka! 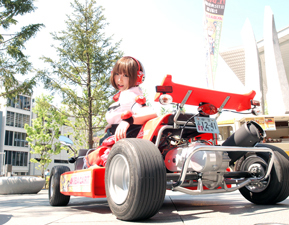 ■What kind of a car is ‘Akiba Kart’? Akiba Kart is a ‘mini car’ that can be driven on public roads by anybody with a drivers license. The body of the kart is red. Although it is a mini car, each kart has a valid license plate. The maximum speed is 60km/h. If there is no set speed limit, the legal speed is also 60km/h. Just like a normal car, the pedal under your right foot are the accelerators and the pedal under your left foot are your brakes. The gear is on your left side. F (Forwards), N (Neutral), R (Reverse/Backwards). 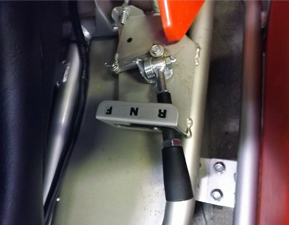 The karts operate on automatic gears. 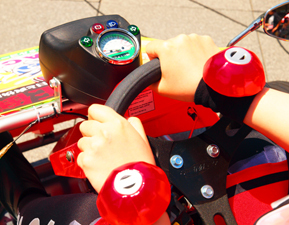 Each kart has signal and hazard lights! It is harder to turn the steering wheel compared to a normal car. The seats are adjustable. Anybody who is between 150 cm and 185 cm should have no problem driving the karts.